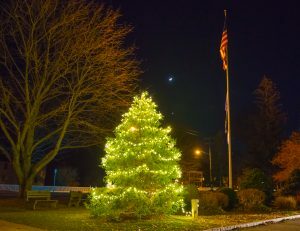 The Shoreline town of Madison held the annual Christmas Tree lighting this weekend. This marks the real start of the Christmas Season for the town. The many small shops provide a slice of small town Americana. You won’t find any “big box” stores along Madison’s Main Street. The shops are are small businesses, often run by the owner/proprietor. The entire Main Street area has been freshly re-designed with new sidewalks and lighting. Boutiques, Cafes, Restaurants, a Movie Theatre, and a bookstore regularly recognized as one of the best in America all await. Here’s an image of this year’s Christmas tree, flanked by the US and Madison Town Flags. Look carefully overhead and you’ll find a Crescent Moon along with Venus in the early night sky.